Well, I am finally back with a new recipe. My previous few recipes received a lot of attention, and I felt a little frozen to try and top them! This may not top the rainbow cookies, but I am excited that I made it. 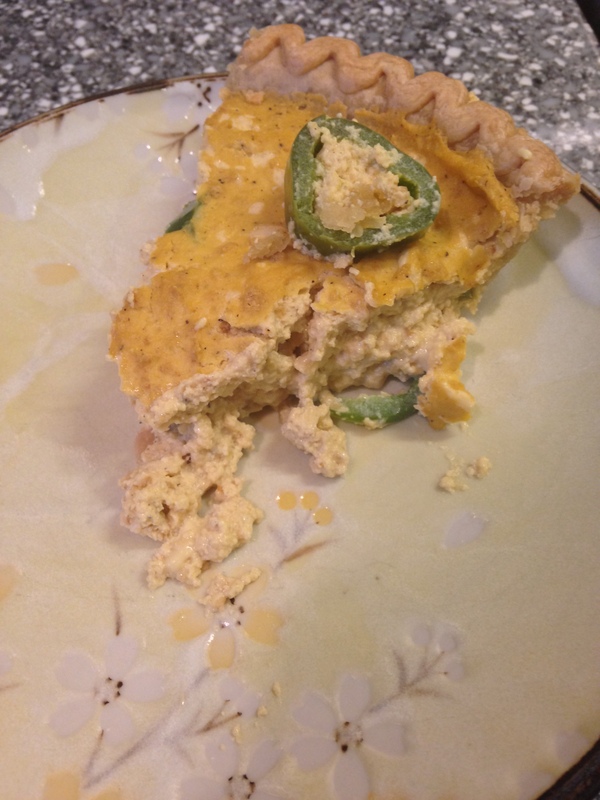 This recipe is adapted from my jalapeño popper quiche I made awhile ago here. This recipe is quite nutritious. 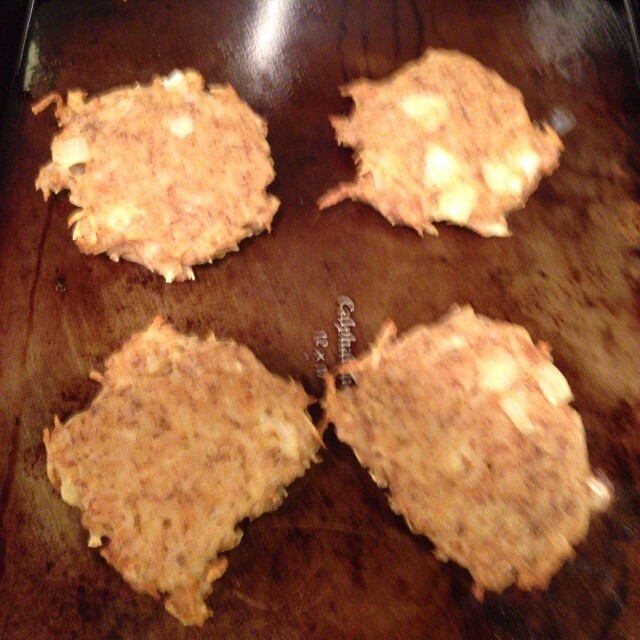 1/6 serving has about 15g of protein, 325g potassium. It also contains 19% zinc (which I have a hard time getting in my diet), 14% iron, 122% b-12, 20% calcium (depending on the vegan milk you use), and is also a good source of folate, B-6, Riboflavin and Thiamin because of the nutritional yeast. I am now quite smitten! In fact, I think it is the closest us vegans have come to replicating the texture of actual bacon. I have adapted my recipe from Chloe Coscarelli…her recipe requires a pound of shiitake (which would cost me at least $10, probably more) and I can only seem to find 3.5 oz containers of sliced shiitake near me. It is so good though. And it is not even fried! I like it by itself, in her Carbonara recipe (http://chefchloe.com/entrees/pasta-carbonara-with-shiitake-bacon.html), and now in this quiche, which is the perfect place for it! Place mushrooms in a ziplock bag. Add in the oil and salt and pepper. Seal bag and shake until mushrooms are coated. Place on a cookie sheet and bake for 10 minutes. Use for whatever reason or in the quiche recipe below. I am back to eating gluten free after majorly slipping up during the holidays. I have been using this packaged pie crust dry blend for awhile, and I have adapted the rest of the ingredients and directions more to my liking. I do love this product and it makes gluten free pies much easier but the method for using it could use some improvement. In the past when I followed their directions, I often found myself working with a very crumbly crust that was almost impossible to roll out and use without it cracking or worse. 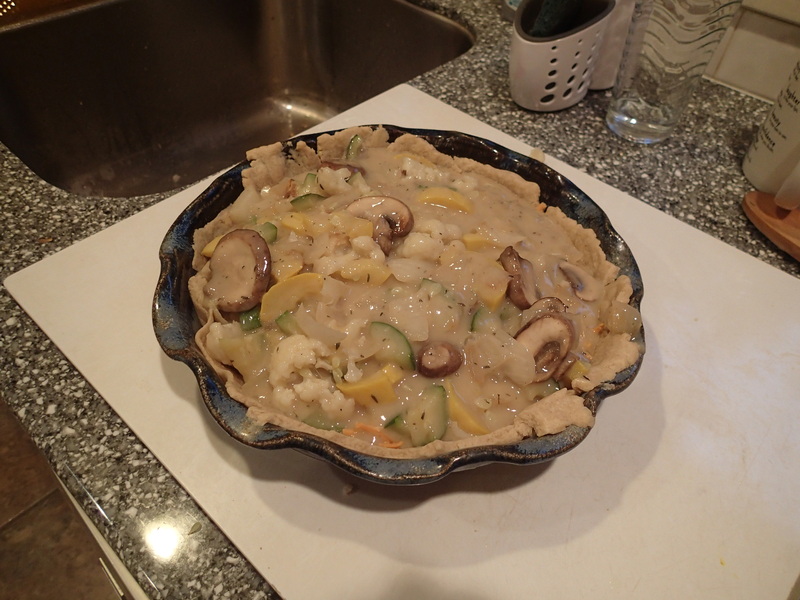 I have been thinking of ways to make it better and more like an actual pastry pie crust, and this seems to have worked. Pour the dry mix into a food processor. Cut up the Earth Balance into small pieces and place into the food processor. Do not process yet! Place the coconut oil into the processor by each tablespoon at a time. Process until a smooth somewhat cohesive mixture is formed. Take out and place in a large bowl. Sprinkle the water over it. Use your hands to combine everything together and make it moldable. Separate in half. If making the quiche, keep one half out and wrap the other in a disk shape in plastic wrap and keep in the freezer, defrosting before ready to use for another quiche or pie of some type later. If making a double crust pie instead, place the disk in the fridge for 30 minutes before using. Spread half the prepared pie crust into a deep dish pie pan with your fingers. Try your best to make it even across the pan and up the sides. Let sit in the refrigerator for 30 minutes. 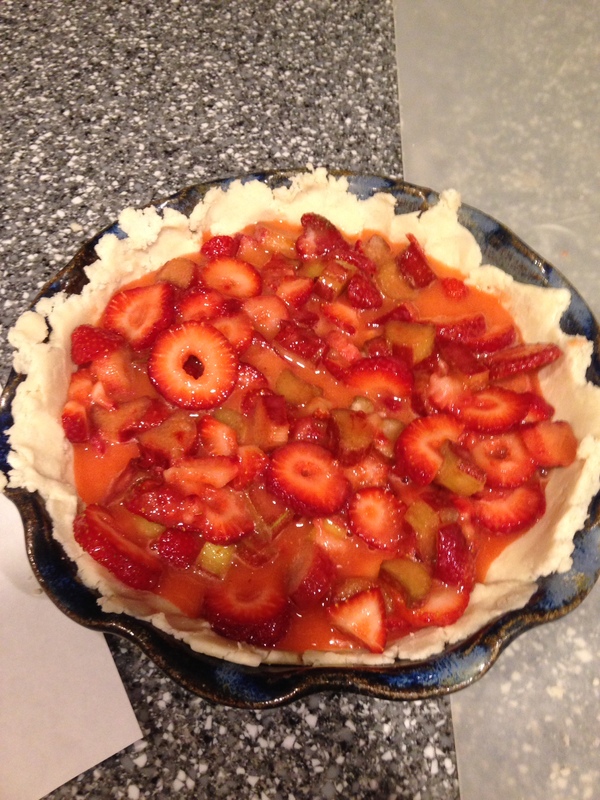 Place pie crust with several fork stabs to the bottom in the oven for 10 minutes. 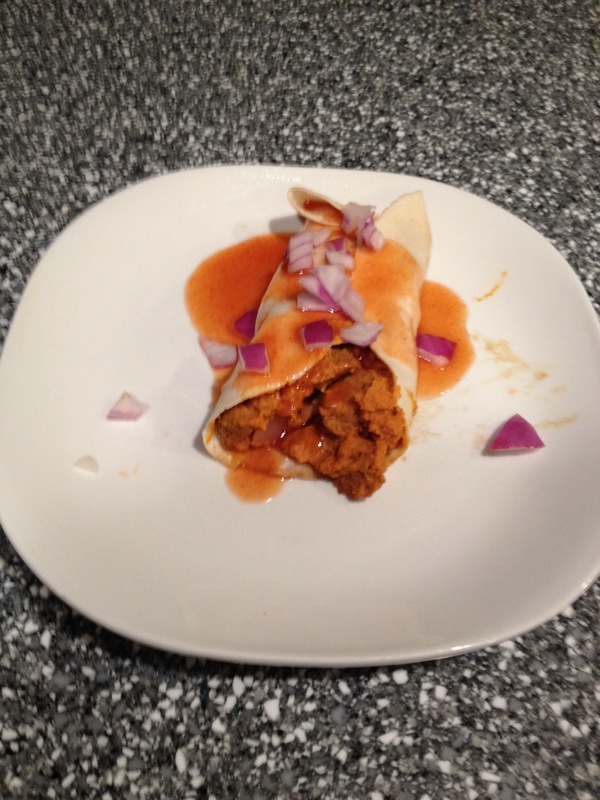 Prepare the filling by placing the tofu, egg replacer, nutritional yeast, and plain vegan milk in a food processor. Blend together until smooth. Add the onion powder, turmeric, and black salt, and process until combined, scraping down the sides with a rubber spatula a few times to really incorporate everything. Scoop out into a large bowl and fold in the Daiya cheese and shiitake bacon until they are evenly dispersed throughout. Spread into the prepared pan with the pie crust in it. Take out of the oven and allow to cool for a bit (10-15 minutes…although it is easier to cut when you wait longer) before digging in! Enjoy! Going gluten free. 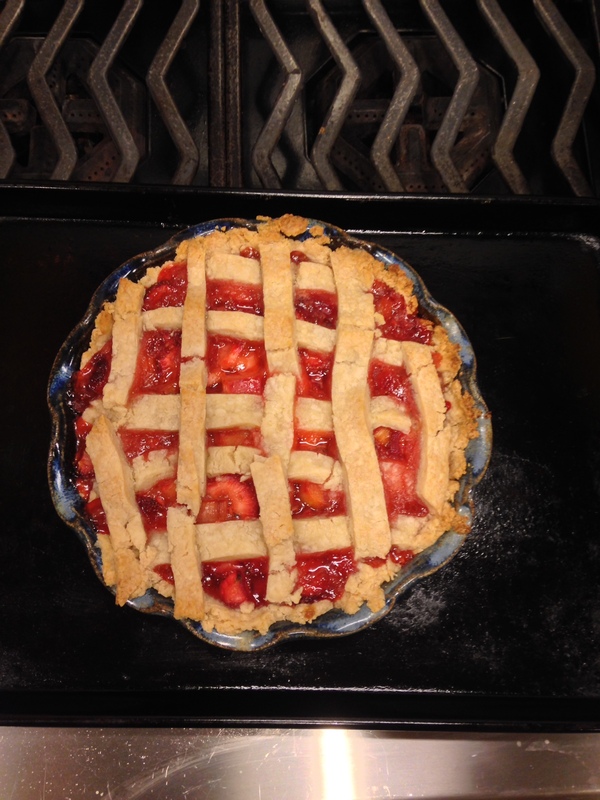 First gluten free and vegan baked good –strawberry rhubarb pie! Well, I am somewhat relieved to finally have an explanation as to why I have been so exhausted lately. I have Hashimoto’s Thyroiditis, which is an autoimmune disorder. I also have hypothyroidism as a result of it. So, I started researching what else I can do that will help me to feel better besides what my doctor is doing for me. And I kept seeing the benefit of going gluten free. I know I seem to have issues with feeling like crap when I eat too much gluten, so I am trying it. It’s sad for me, because I really loved gluten. I will need to learn more about baking gluten free, and I know I can do it, and be making all sorts of new delicious vegan AND gluten free stuff in the future! 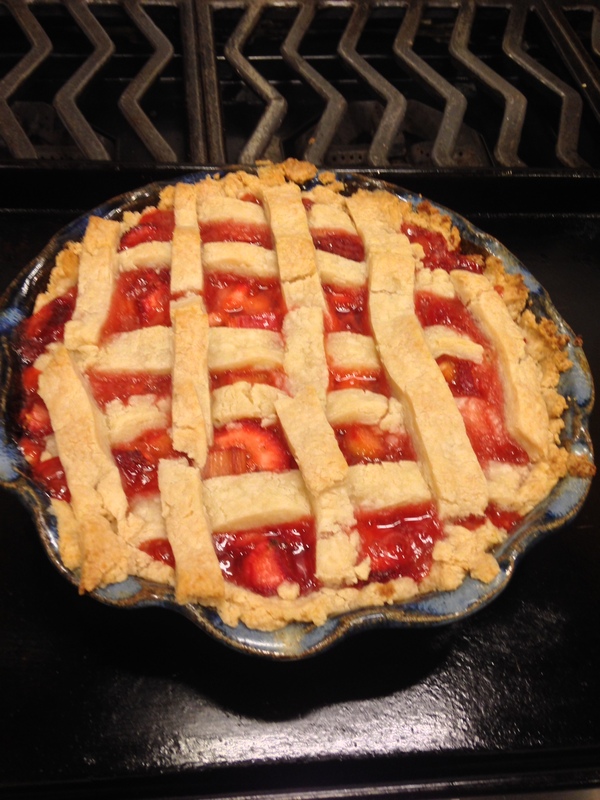 It’s my favorite pie of all time, strawberry rhubarb. I actually used Bob’s Red Mill Pie Crust Mix. I had used it before and thought it was awesome even when I wasn’t gluten free. First make the crust. Follow the directions on the back of the packaging. I always need the full 8 tbsp of water it says I might need. You may need 6 or 7 like it says. I find it hard to roll out after it’s been in the fridge…but I manage to fix it up if it breaks apart a bit as it’s pretty easy to put back together. 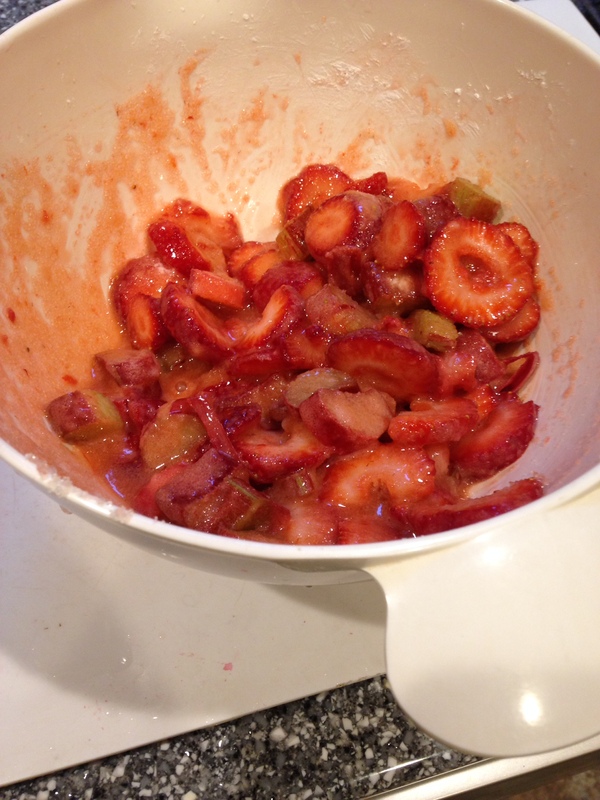 While the crusts are chilling, combine the strawberries, rhubarb, sugar, cornstarch, and lemon juice into a large bowl. Take the crusts out of the fridge after the hour has passed, and roll one out into a large circle. Press into a pie pan. To make a latticed topping, cut strips out of the second pie crust after rolling it out a bit. Place the strips across the pie. First lay them out horizontally, then vertically. You may need a spatula to help you get them off your work surface, and they will probably break apart, but it will still look nice even if they break apart on the pie. Just smoosh them together a bit if they crack or fall apart in the process. Place in the oven with a cookie sheet underneath to avoid the gooey delicious filling from falling on the bottom of the oven, making a mess and a nasty smell/smoke. Bake at 425 degrees F for 15 minutes, then turn down the oven to 350 and bake for anywhere between 30-60 additional minutes until the crust is firm and golden/brown around the edges. Hi! Didn’t realize I’d be back so soon. Today I invented an awesome new recipe. This one will not be in my zine, haha. 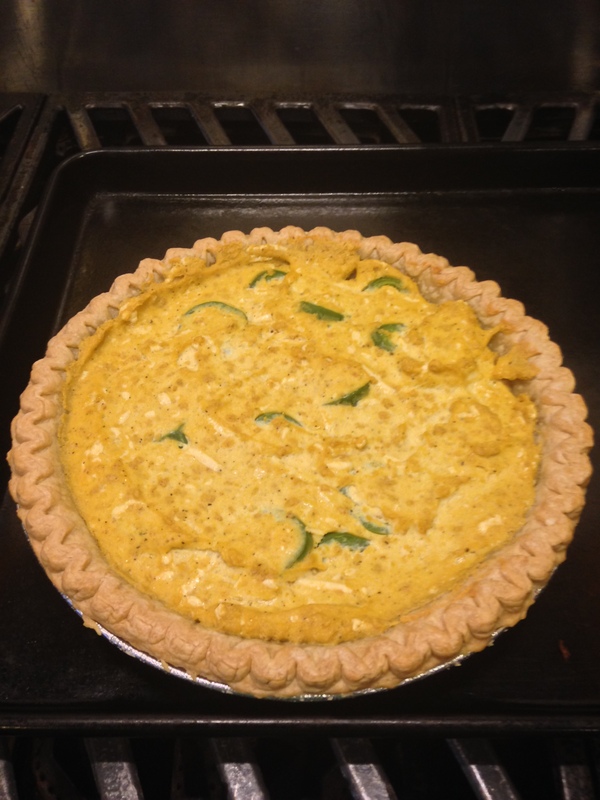 It’s a jalapeno popper flavored vegan quiche! 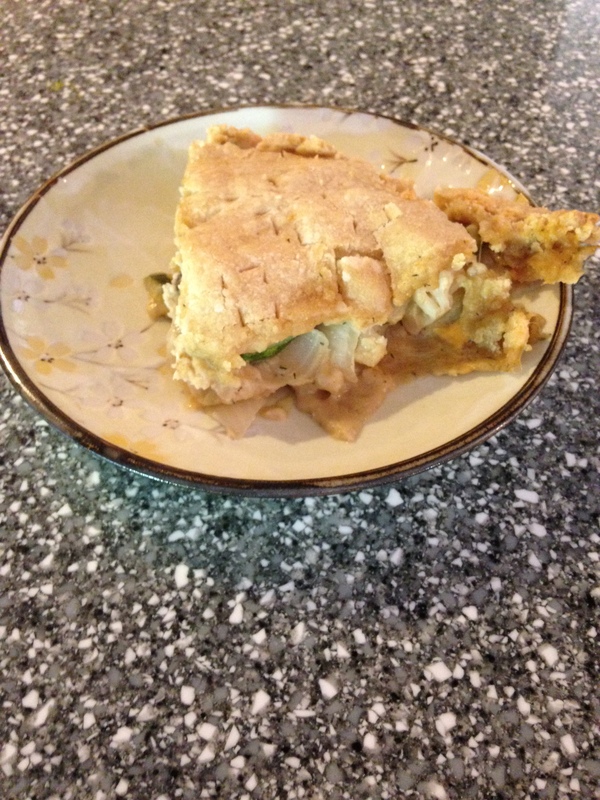 I used a pre-made pie crust bottom–gasp. 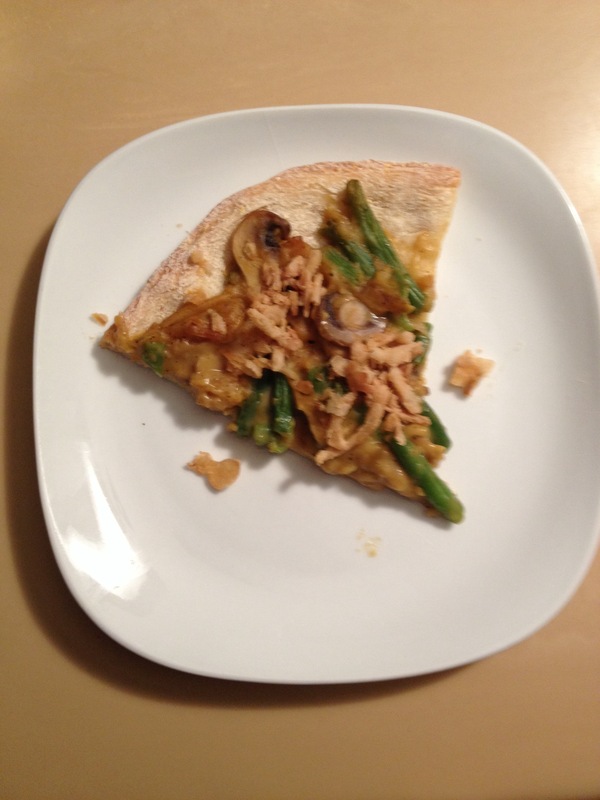 Surprisingly a lot of store bought pie crusts are indeed vegan! I wanted to make it quickly so I chose that, but if you want to make your own, here is my recipe for a pie with a crust recipe (you’d only have to make half of it). Place tofu, egg replacer, nutritional yeast, Earth Balance, non dairy milk, onion powder, black salt, and black pepper into a food processor and blend until smooth, scraping down the sides with a rubber spatula and then blending a bit more. Transfer to a large bowl and fold in the daiya cheese, bread crumbs, and jalapenos. Place into pie crust, smooth down with a spatula. Bake in oven for 35-40 minutes. Allow to cool slightly, then dig in! I can’t believe it’s already Thanksgiving. 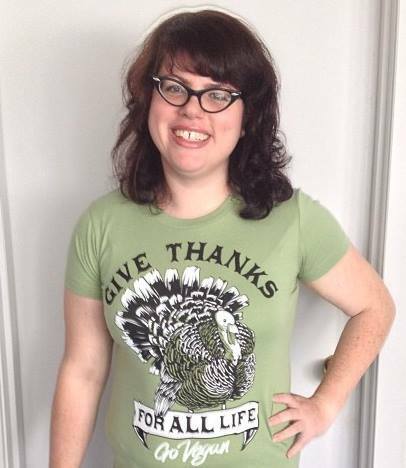 It seems like just the other day I was writing about last Thanksgivukkah. Too bad this year hanukkah is later. I haven’t gotten a chance to post about it but I had this really great Vegan Thanksgiving Food Demo along with Rhode Island Vegan Awareness and Urban Greens Co-op in Providence, RI. I taught a large (being that only 13 people were supposed to be there based on sign ups) group of 23 people, mostly all vegan or vegetarian how to make my butternut squash and sage ravioli. It was a really fun time, and the first time I’ve ever done something like that. I’d say it went really well. I am looking forward to doing more events like that in the future. I had pre-cooked the Gardein holiday roast and brought it to my family’s thanksgiving gathering. I had also made sage cashew cheese for an appetizer. My mom brought a vegan green bean casserole. My great aunt had made vegan mashed potatoes with oil, almond milk, and chives. I was most excited about this one recipe I created for us to eat for dessert, which I will now share here. Grease a cupcake tin with either a generous amount of cooking spray or melt some extra earth balance, put some on a paper towel, and spread around the cavities of the pan until well coated. This is very important because otherwise you will have a really hard time getting them out. In a food processor, mix together the cookie crumbs, sugar, and Earth Balance. Scoop out an even amount (use spoons to measure, about 1 1/2 table spoonfuls) into each cupcake cavity. Press up the sides as much as you can while still keeping the bottom crust in tact. I did not have the crust going totally up the sides and it came out fine. Bake in the oven for 10 minutes. It may be a little bubbly but it will crisp up a bit as it sits while you make the rest. Meanwhile, in a food processor, blend the sweet potatoes until smooth. When the crusts are baked, turn the heat of the oven up to 350 degrees. Whisk together the flaxmeal and water until goopy. Pour the flaxmeal and water into the pureed sweet potatoes in the processor, along with the Earth Balance, maple syrup, cinnamon, vanilla, and sugar. Blend until fully combined and smooth. Taste for sweetness. You can add more sugar if desired. Place 2 full tablespoons of the mixture on top of the crusts. Stick a marshmallow in the center of each. Take out of the oven and allow to cool completely. When cooled, take a butter knife and loosen the edges by circling the pie and breaking up the crust’s edges if stuck to the tin. Take out with a metal spoon and place on a serving tray or whatever else. They can be refrigerated if they are not being served immediately. Phew, I am barely making it to post this tonight. I literally just finished it, as it requires 3 hours of chill time. This recipe was originally inspired by a recipe for lemon pie in the book Soy Not “Oi!”, but I ended up changing it quite a bit once I realized it was going to taste better and be a better consistency the way I wanted to. It’s still somewhat runny, but is incredibly delicious, if I may say myself (I just tasted it!) I am bringing the rest (I made 2!) to school tomorrow so they can all try it and give me feedback on it, as well. 1 can coconut milk (I used Goya brand), placed in the freezer for at least an 1 hour before use with the white cream scooped out only, not the rest of the clear liquid. Place flours and sugar in a food processor. Give it a quick whir to combine together. Add 1 tbsp of shortening, quickly pulse, and continue to add the shortening 1 tbsp at a time until you’ve put in 3 tbsp. Smoosh into a round disk shape, and wrap in plastic wrap. Roll out the dough into a thin round layer on top of plastic wrap. 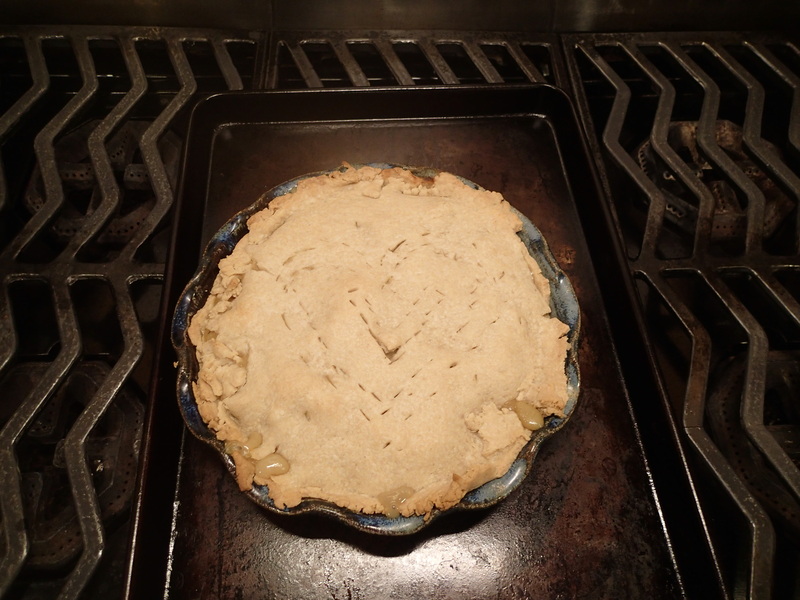 Carefully place on top of a pie pan and shape the crust with your fingers around the edges of the pan. Bake in the oven 7-12 minutes until golden and crispy looking and not mushy when touched. In a saucepan, add sugar and cornstarch. Stir in the coconut milk and pineapple juice. In a separate cup, whisk the arrowroot and water together. Add to the other ingredients in the saucepan. Add the margarine and boiling water over the Earth Balance so it melts. Heat on medium heat on the stove until just starting to thicken, stirring frequently with a wooden spoon. Once starting to thicken, add in the agar agar powder and immediately start to whisk until combined. Be careful to whisk a.s.a.p after placing it in the saucepan and whisking all around the pan or you may end up with agar agar clumps throughout. It will thicken very quickly after this step. Shut off the heat and continue to whisk for a bit. 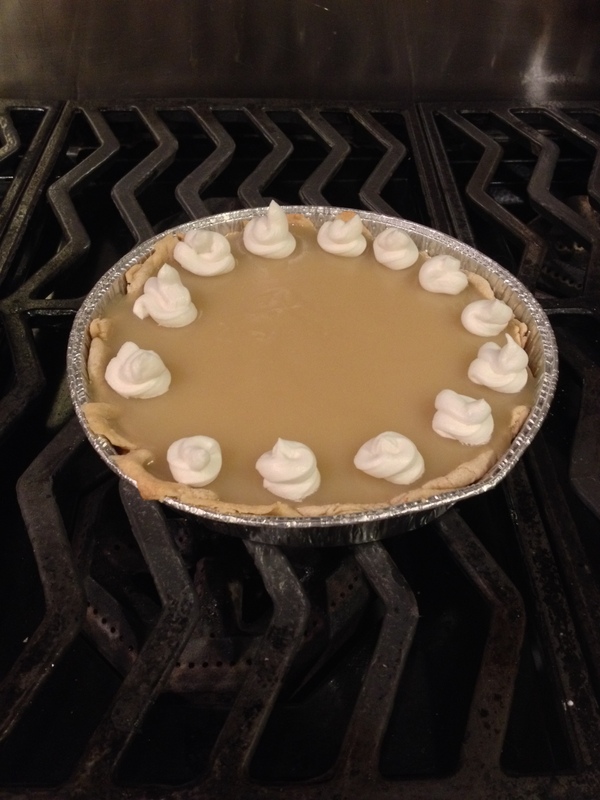 Pour into the pie shell you made and refrigerate for 3 hours before piping the whipped cream on top. Place the coconut milk can in the freezer for at least 1 hour before using. Open the can and scoop out the solid cream with a spoon. Use the remainder of the watery coconut milk in a smoothie or whatever else you think you’d like it in. Add in the powdered sugar, shortening, and vanilla. Mix with a rubber spatula until combined. 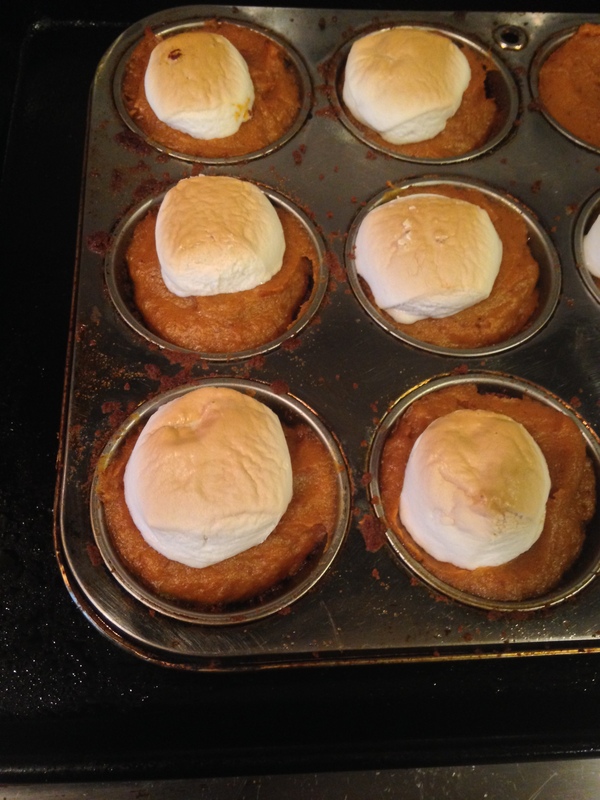 Use a handheld electric mixer and whisk in circles until peaks form. 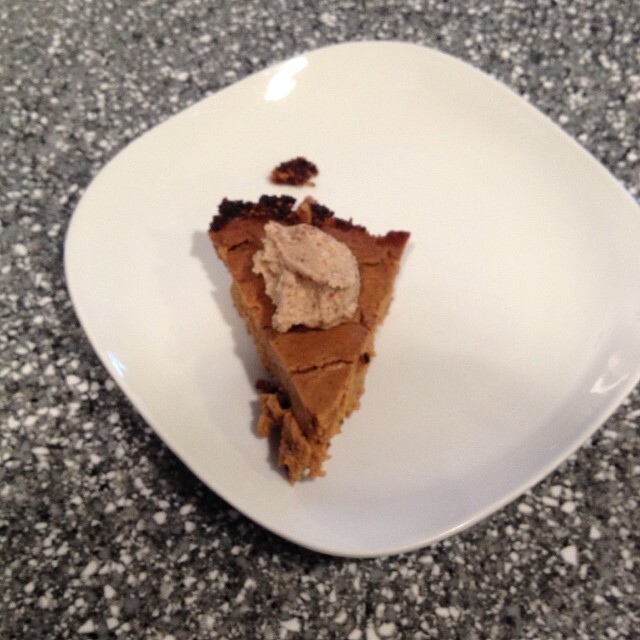 Place in the refrigerator until ready to use/place on top of the pie, or for at least an hour until it’s more solid. I like to place it in a ziploc bag and cut the tip and squirt it out in little round globs. You will have extra left depending on how you choose to decorate the pie, so use every last bit of that for other delicious reasons! Oh, and here’s an interesting wikipedia article on the history and other fun facts about one of the ingredients I used, agar agar. See you tomorrow for another entry for Vegan MoFo 2014! Vegan New England Style “Lobstah” salad made from hearts of palm and 7 days of new smoothie recipes to share! I did this thing this past week that I was going to blog about. Unfortunately I got a new laptop and when I transferred all the pictures I had from my phone to my laptop, (including the ones I needed to make the blog entry) some of them got lost in the shuffle. I tried a new smoothie recipe every day of the week, and wanted to talk about them. 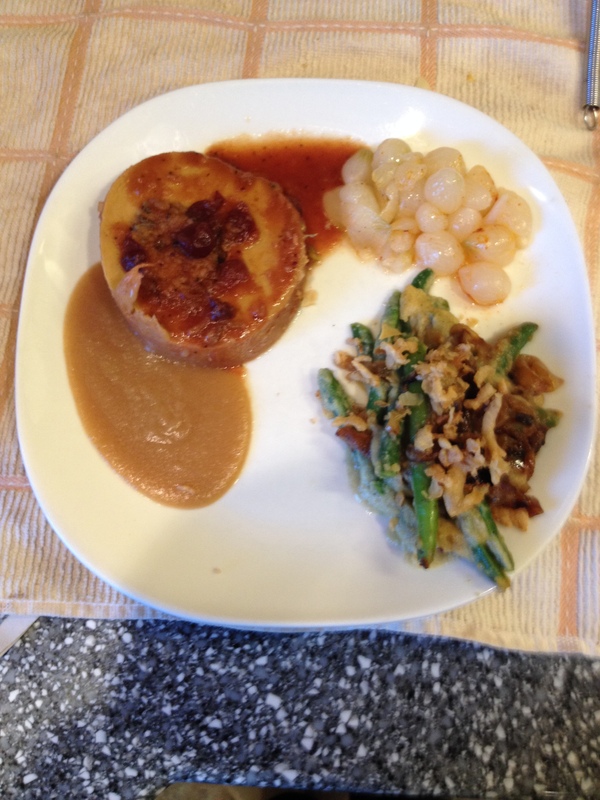 Instead, lacking pictures, I will post the links to the recipes I used at the end of this entry. 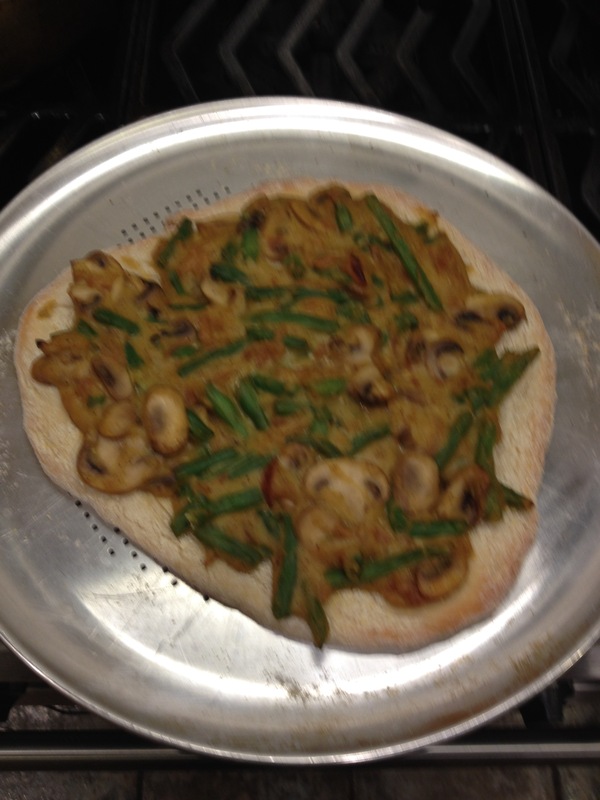 I do however have a picture for the recipe I am about to share! Growing up in the New England area of the East Coast United States, lobster salads have always been a thing. They’re also usually kind of a big treat. Today I was inspired by that, and wanted to make a vegan version. This is truly “lobstah” as Bostonians and Rhode Islanders would say, but is free from any cruelty towards the real sea creatures. I used hearts of palm as the main “meat,” and some sun-dried tomatoes as well to give color, flavor, and texture. There is a mix of seafood-y spices, lemon juice, and other seasonings, and the mix of vegenaise and vegan sour cream makes a delightfully creamy dressing for it. Place chopped, drained, and processed hearts of palm in a mixing bowl or other large container. Add sun-dried tomatoes and stir. Add spices and take a spoon to mix them into the chopped hearts of palm and sun-dried tomatoes. Make sure they are evenly coated. 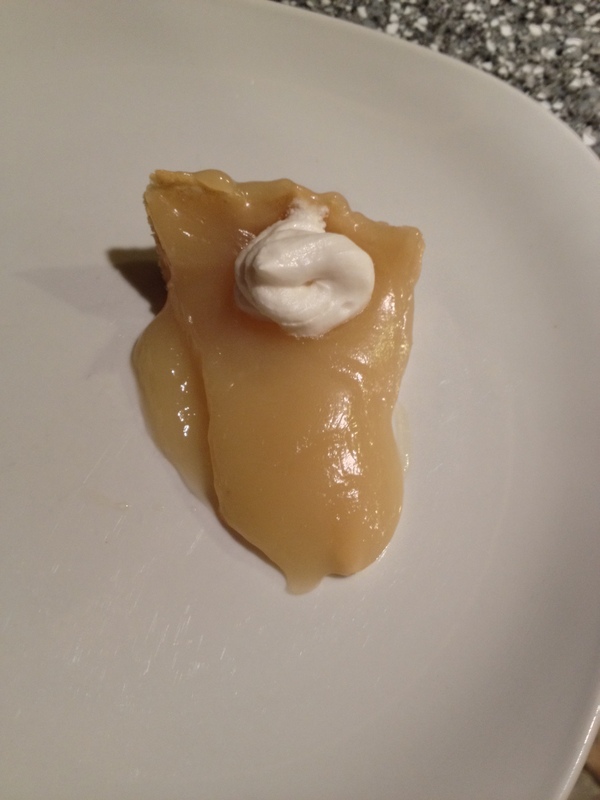 Add lemon juice, vegenaise, and sour cream and stir. 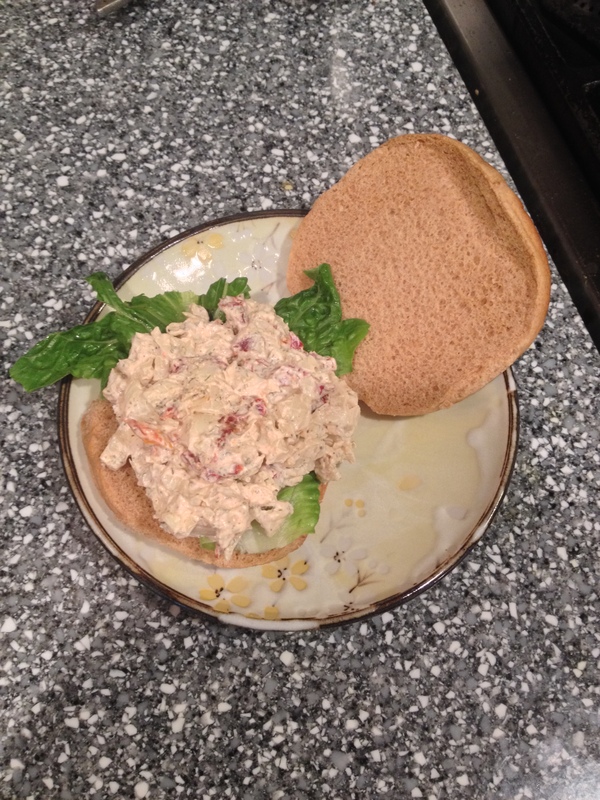 Serve in a bun with some crunchy lettuce, or on top of salad greens with whatever other toppings you desire. Raspberry Lime Zinger from Oh She Glows *Second place in my favorites! Orange Creamsicle Smoothie (also from The Sweet Life) *My favorite one I tried!